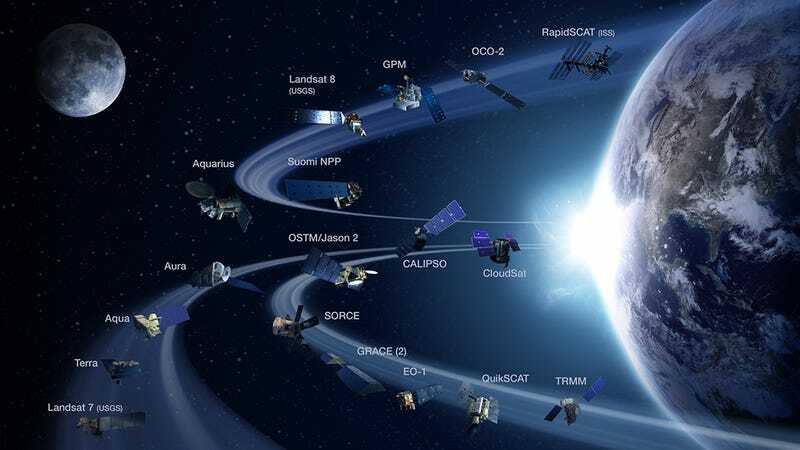 NASA has a lot of satellites in orbit staring at the Earth. I knew that, but I hadn't quite realized just how many were currently active! Which satellites do you recognize? Any favorites? Landsat has been around forever providing absolutely gorgeously surreal views of home, while RapidScat is a brand-new arrival glommed onto the International Space Station. I admit I have a soft spot for the Orbiting Carbon Observatory (OCO2) after watching it eventually launch last summer. The Global Precipitation Monitor doesn't take photographs so much as continuously track rain and snow in detail that is boggling to behold. I only have a passing familiarity with Soumi NPP — that's the satellite that contributed the base-image for Earth Selfie Day, which is more than I can say about CloudSat, an experimental radar project I've never encountered. NASA&apos;s Orbital Carbon Observatory Has Launched! What is truly incredible about all this scientific self-reflection in satellite format is that all the data from these projects is free to peruse. Yes, most of it requires scientific background or familiarity to figure out what it is that you're looking at, but this data is accessible if you want to put in the time to learn how to use it.